It was only about a year ago that I embarked on a collaborative film project (Ch’u Mayaa) with artist Clarissa Tossin where I created choreography and performance at a Frank Lloyd Wright home (i.e. the Hollyhock House at Barnsdall Art Park) in the same Los Feliz neighborhood of Los Angeles where the Sowden house is located. Having worked in a Wright home before, the architectural style at the Sowden House offered a sense of familiarity to me, as it was very clear how influenced Lloyd Wright was by the work of his father which denotes colonial implications through exoticism of the foreign. Knowing this, my instincts were to apply decolonial practices during my process to cultivate habitable space for me, plus one. As I begin to nest my own home, I find myself in a moment of creating and performing while pregnant, accepting and embracing all the changes that come with my body and the influences this process has had on connecting me with my womb and child. I will be a mother. I am a mother. The façade is typically the outside front of a built environment. Often, the façade is a fleeting experience that frames the entrance of a building. With intention, I set out to be within the façade, to imagine it as an interior dwelling. In doing so, I come to my body and acknowledge its most present signifier of growing life, of a world rooting me from within. Rooting Within. The façade at Sowden House has three tiers. A pathway is carved for me to descend into the various stages of my evolving womb. Perceived from a two-dimensional perspective, the symmetrical halves of the Sowden façade can pass as an abstraction of the female reproductive system. Centralized gates flank open to greet a concrete-block sculpture. Here an altar is created with offerings for Atabey. Connecting with my indigenous roots, I prepare an altar to Atabey to grant me a safe childbirth and connect me with my great/grandmothers from my matriarchal lineage. I have made the passage from their womb to be here now. From this intentional place a corridor leads outwards, departing from the womb. When I first came to the Sowden House I was amazed. I was especially taken by the stairwell as it somehow reminded me of the old city of Jerusalem. My family lives in Israel and there was a time during the Jewish high holidays several years ago where I found myself wandering around the Church of the Holy Sepulchre at 1am almost entirely alone. The only person I saw was a long haired man draped in a flowy garment resting in the corner. There was something so fatigued about him, as if he had been sitting there for a thousand years. I could also feel the vibration of this man’s desire to be in a time and place that he can only imagine. I could feel him wanting to be transported to a different era, a different existence. When I walked through this stairwell for the first time I immediately was reminded of that image and experience I had. I had a feeling of wanting to sit in the corner between the two corridors and maybe if I sat long enough I would know all that happened in this space, maybe I would be transported and become a part of something I could never see but would begin to feel. Being a mother, I often think of the miracle of life and wonder if I stare at my child long enough, if I hold him long enough, would I be able to be part of him more deeply? I wonder if I would be able to be that much closer to a time before time, before I had a name, a time of pure sensation and connection to something greater. In this piece I am trying to capture the feeling of a passageway to a place unknown but only imagined, and will let my presence connect me more with the possibility of being a being in that space. I feel the stairwell like a meditation chamber and a kind of birth canal, there is stillness and there is flow. My voice and body will carry through and connect those emotions, past and present, through abstract song, sound, touch and light. I have been intrigued by the idea of Choreography as preparation. Preparation as a durational learning practice; a notion of kinesthetic liveness as an ongoing immersion. Movement breath triggers multiple diverging responses, an interconnected network; an activating unfolding and folding simultaneously. Each exhalation and inhalation build infinite expansion from with-in, and with-out. The practice of Daoyin has become the essential foundation for our movement and choreographic approaches, wherein creative explorations can be understood not as a single existence but co-existence in interaction and dissolution of opposites. Daoyin is our learning tool, which conduits new access into our body; it mediates new internal and external discovery. It is a reservoir of hidden ideas. It brews and transcend experience and enlightens our new understanding about: body in space, being present in the space, discovering the space, a process of moving air, touching texture, giving weight, taking weight, capturing spatial essences as one moves through space. The very nature of Daoyin enables us to move through the Sowden house, learning and inhabiting the space as we move through it, but also gaining empowerment as we experientially expand our embodied knowledge during our durational presence. We dare to enter into their intersection, explicitly male identified, an intrinsically violent construction of desire. Service: We are conscious of the reciprocation in being watched in performance and spectatorship, and the art of managing states of agency. Through our internal Daoyin informed explorations, we are beginning to co-op and counter the mechanisms of an external construction of desire. Relatedly, through our Daoyin practice, we enter a deeper embodied understanding of space, even if it can be said to be also a labor of ritualization. This notion of dance as embodied socio-spatial research implies a different kind of service, one that is deeply personal. For us, our service requires an accumulation of a special set of embodied skills and expertise in how the body functions in space and social context. Full text will be available as a booklet at PASSAGES events. This work, like this essay, tumbles over and through psychological and material human fantasies. Jack Smith’s Oriental fantasies. Ron Vawter’s on stage character fantasies. Maria Montez’s on screen fantasies. Lloyd Wright’s fantasies of the built environment. John Sowden’s fantasies of a glamorous home as site for entertaining. George Hodel’s surgical, murder fantasies. The stage as fantasy. Jack Smith’s fantasies are often characterized by an uncomfortable orientalism: sparkling headscarves, Polynesian fabrics, feather headdresses. In his slideshows we find images of Smith “trapped” in various narratives; as a well dressed businessman taking calls, dancing or reclining in a Scheherazade fantasy, a glitter-faced mime-creature, walking and talking to his penguin in safari garb, a brooding gypsy, and as a futuristic trash lobster cyborg. Muñoz writes, “[Jack] Smith’s investment in other cultures initially appears to be nothing but Orientalist fantasy, but those renderings of the East should be considered simulacra of simulacra because they are not based on those cultures but on cheesy Hollywood fantasies of “over there” or a “not here”.” While Smith’s cultural appropriations are offensive and even alarming at first glance, his deeper critique lies in revealing the pathological, psychosexual, and materialist effects of more than a decade of popularized, shiny spoon-fed Hollywood fantasies. In films we escape from our reality into the moving image, one that is knowingly false but seductively (and dangerously) influences how we deal or not deal with the forces that shape our lives. Run out of the house or jump into the pool? Jack Smith brings these Hollywood fictions onto the street alongside the trash, the rich, the rats, and the rent. His commitment to play never seems to end; not the perfunctory kind of play rich people are afforded but rather the serious dislocation of things, the constant pulling-the-rug-out-from-under everything, including oneself. This reveals the fragility of the forces that shape the built environment and its social hierarchies. A shimmy and a shake can cause the great earthquake! Smith’s context was McCarthy, Nixon, Reagan, Cohn and the like. As the United States political system deploys otherness as an imperialist tactic, Smith, as a gay and poor artist, assumes these otherings on and through his body in what I see as a Brechtian approach to critiquing identity construction. It puts on display how notions of normalcy and otherness are used as methods of oppression under a late capitalist democracy. In all of Smith’s characters there is a failure at play; self-awareness in the attempt to transcend but knowing he will never fully reach the alternate reality. This is both the gaiety and doom of it all. So why not make the performance ten hours long? Three days? A decade?! The queer body, collective and individual, is site for disaster and possibility; disaster in terms of the violences, failures, categorizations, deprivations, and erasures caused by hetero-patriarchy. This reality is actual, structural, and historical. While it is a violent, depressing, and deadly existence, the failures of the queer body and mind under the framework of hetero-patriarchy allow for the possibility of new and different ways of being in the now and imagining the future. The queer body is not designated to gender and sexuality identifications only but expands to ideologies that intersect and parallel the anti: anti patriarchy, anti capitalism, anti imperialism, anti military, anti police-state, anti white supremacy, anti institutionality, anti nuclear family, anti fascism, anti landlordism, anti Palestinian apartheid. Anti artisanal vegan matcha gluten free ten dollar cupcake shops! The queer body is an essence to mine within oneself, to share with kinship and vigor, and the take, however possible or impossible, into the rhythm and roles of daily life. This is a recipe for the imagination of different tomorrows. Did Jack Smith ever perform in Los Angeles? Within the imaginings of Jack Smith, Mario Montez, and Ron Vawter I find an anti-establishment sensibility that grates against the very concrete blocks decorating and structuring the Sowden House. While similar in their fetishistic approaches to the exotic, these artists differ from Lloyd Wright because they never physically built their temples, rather used the idea of the temple as site to reimagine how history is fed to us, how it is digested, and how it influences the narratives that shape the hierarchies of this moment and our futures. The queerness of death. Perhaps the inability to know death is a queer thing. Like Muñoz’s illustration of queerness as a horizon to always look toward and never fully reach, perhaps death is too a horizon. The limits of the human brain to comprehend death leaves space to imagine, fantasize, produce images, narratives, and meaning. We never fully become dead until we are dead and in that moment we shift from this consciousness into something unknown, something queer. When someone dies their life becomes a narrative, invented and reinvented, reinterpreted, retold. It becomes a queer thing owned and passed around by many people. The AIDS pandemic forced thousands of youthful individuals to confront their deaths prematurely. The time and space between diagnosis and death becomes a queer thing. A space when Jack Smith and Ron Vawter made art. A time when David Wojnarowicz reflected on his life, his intentions, his experiences, his desires and fears. It is life’s waiting game accelerated: the interruption of a normative lifetime. Jack Smith’s famous penguin, Yolanda Penguina, was never alive. Is Yolanda the prop of a mummified exotic bird, once in the wild, captured for the zoo, and freed from captivity only in its afterlife? All we have in this realm is the empty container of Yolanda’s promises; a vapid and fantastic symbol of freedom. The prop of Yolanda Penguina is the prop of Maria Montez, Mario Montez, Jack Smith, you and me- trapped in captivity and waiting to be free. Myth has it Jack Smith, in his 50’s, wanted to contract HIV so he could spend his last days in a warm room with three meals a day, laying in a clean bed as though he was Maria Montez in glamorous recline. Muñoz, José Esteban. Cruising Utopia. New York University Press, 2009. Page 171.
that arouses me and chills me all at once. or worse, too far behind. where I cannot choose to open or close it. I’d choose you every time. Rest comes easy with you. Walking into the Sowden house one passes into another world. Removed from the streets, the house sits above the city in its own dimension. While the house maintains a grandiosity and commitment to Mayan Revival architecture, I explored the space through the lens of classical elements: fire, water, earth, and air. Following an enclosed labyrinthine passageway, the main space expands into an open air courtyard stretched out with an elongated pool. Flanked on either end of the courtyard are two welded sculptures that breathe fire straight into the sky. Doors and windows become one here, every entryway open to pass through and let the air flow. The cast concrete blocks loom over the house with a not just a physical sense of gravity, but a weight that tugs at the spirit. This combination of elements commands the household and makes one consider how the space has been primarily used for social gatherings over the decades. The uniqueness of the space has allowed for many different types of events throughout the years, and it remains a place that many artists still want to exhibit in. Considering all this, the most essential element of the Sowden House is people, built into the architecture are the innate movements of people gathering and engaging with the art and flow of the structure. It is here the house breathes with life. In weaving, weft is thread that passes over and under warp threads. To make a textile, the weft thread moves along the length of a loom passing repeatedly back and forth. The transverse weft could be one long thread or many different threads. In WEFT, a performance that will occur during PASSAGES at the Sowden House on Janurary 12 and 13, Flora Wiegmann and I will dance through the home’s interior, weaving a number of inspirations over and under the architectural time warp of the home. When Jenny Landers, co-owner of the Sowden House with Dan Goldfarb, reached out to me via homeLA (thanks to Anna Milone of the FLAX Foundation), I began to feel the vast layers present in and around the home. It is possible to approach the site architecturally, materially, conceptually, sculpturally, historically, mythically, and still the home may feel elusive and mysterious. Its presence circulates wind, ideas, people, and time between two colossal passages. 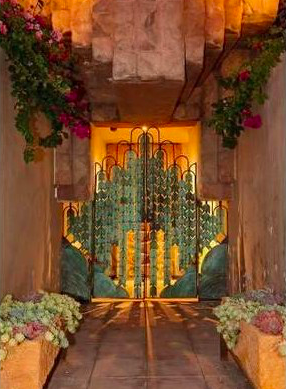 These portals suggest the passing of things and stand at the center of how homeLA is partnering with the Sowden House. Both images in this post are stills from a video shot by Delaram Pourábdi of PARADEUX. Together, Delaram and I imagined a process that would allow each of us to respond spontaneously to the cyclical nature of the home. My grandmother had recently passed when we began this conversation and I had inherited a large number of her shoulder pads. Ada had sewn clips to each round pad and to the interiors of her blouses in order that she may choose when and when not to raise the height of her frame. By sewing these pieces together, I had incidentally built a material partner, a soft sculpture that would enter parts of the short film, PASSAGES. In April of 2016, I went to go see Catherine Opie: 700 Nimes Road, at MOCA’s Pacific Design Center location. Catherine’s photos presented a portrait of Elizabeth Taylor, through her home and the objects that filled it. A mix of broad views of the Bel Air home and detailed shots of jewelry and keepsakes adorning her dressers. Considering that just a week later I was to start documenting homeLA // Victoria Park, the show was encouraging to say the least. The show has since come and gone* and I’ve been thinking about putting my inspiration into words for sometime, but it wasn’t until some recent events occurred in my life that helped me understand Opie’s work - and mine - in a new light. Earlier this year, I lost my grandfather. One of the first things I found myself doing in the aftermath of the news was documenting his house. The way it was when he left it. The first chance I got, before the rest of the family arrived. The furniture, the knick knacks, the stains, the folds - the home. While this isn’t the strangest response, given my background, it quickly became part of my process of grieving. Over the past four years I’ve documented every aspect of homeLA: artists developing work in new spaces, capturing themes and patterns as they emerge, and doing so from every angle and corner of every home. I document not only the artists as they explore the houses we’re invited into, but also the personal details that make the houses, homes. I work to capture the living breathing spaces that are given life by the people who inhabit them. So when it came time to say good bye to my grandfather, I felt compelled - and quite comfortable - to capture who my grandfather was, and how he lived at the end of his life, through the documentation of the things that filled his home - particularly because he took pride in his belongings. When I walked into the Pacific Design Center, I got to know Catherine Opie's work on a much deeper level than I had before. I was familiar with her work, but only through my studies and the occasional run-in with a work or two. I had never seen an entire exhibition dedicated to her. That exhibition gave me a deeper understanding of the work I do documenting dance in domestic spaces, but it wasn’t until I found myself photographing my grandfather’s house that it really sank in. There was one photograph in particular (and even an exhibition note) that really had an impact. The photo was of Taylor’s kitchen table, with the table as subject, and in the background through the mirrored glass walls, you could see Opie. She’s unassuming - you could look at the picture and not notice her - but she’s there. This was a powerful moment for me. During homeLA, I do my own dance of sorts: trying to get the best documentation without getting in the way of the dancers, or audience when they enter. Over time, I developed an unspoken guideline to remove myself from the images. It’s not about me, it’s about the artists moving throughout the space. This unconscious self-imposed constraint even manifested itself in the rehearsal space - where I have the freedom to move around as I like and not worry about audience. Until this exhibition, homeLA, for me, was about the home, artists, and hosts, but seeing Catherine in that photo added photographer to the list. Her inclusion in (a few of) the images throughout the show didn’t ever position her as the subject, but rather was a natural inclusion of her body in the space as a part of the process. In our “conversation” she let me know it was ok. Being in the photo doesn’t take anything away from the photos, but rather encompasses the full experience - and in my case with homeLA - which includes the roaming photographer. All these considerations came back to me after I started documenting the layout and objects in my grandfather’s home (did I mention that Taylor died during Opie’s process of photographing the home?). As the rest of the family entered, I became very cognizant of bodies - mine, theirs, and the lack of my grandfather’s - in the domestic setting we found ourselves in the days before the funeral. How were people using the space? What was being moved? Had I captured it? Should I re-photograph as the lighting changed? I found myself stepping back and watching as people moved through the home. Even though I had already had my time to document the framework of the house without people in it I continued documenting the little nooks and crannies. Capturing the changing light on different objects. How had my grandfather experienced things in the day vs. at night? I found myself jumping up to photograph something when I remembered a specific memory. In one instance a shadow leaned into frame. I paused. My conversation with Catherine came back to me. I realized that keeping it in the picture allowed me to be part of the process. Allowing myself to be in those pictures shifted the process from cataloguing to documenting, allowing me to say goodbye and shape my final memories in the space. I put my experience in conversation with my grandfather’s, in a way that Opie has had me thinking of since I saw her photos. The photos of my grandfather’s house created a sense of release through their encapsulation. If we couldn’t keep objects, I could keep photos. This was the end. Of an era, as they say. But it actually felt that way. My grandpa is the last family member of his generation to go. The golden boy of 1928. It was not only the end of a life, but also a shift in family elders. As we cleaned his house I couldn’t help but think of the objects that had come from a distant past and lived long storied lives, one that will not be continuing on in our family. To say goodbye to my grandfather’s dresser was also saying goodbye to my grandmother again. While we said goodbye to her years ago, we would not be keeping the his and hers dressers like grandpa had previously done. Our objects speak to who we are; our tastes and styles at specific times and places. If we lose that we move on with a little less clarity. Documenting things was not just about the objects but of a past time and place we could no longer hold onto. So I documented, as best I could. While I could shrug off the fact that these feelings towards my grandfather’s home and his personal affects were sensitive due to the personal nature of the space, I’ve had this affinity for capturing personal effects within homeLA for awhile. I don’t just document dancers moving in domestic space, I also capture the details of the home - often times without artists interacting with them. Yet I often question the need / reason for capturing these types of images. Why do these details matter? What purpose do they have amongst the images of artists developing their work? Additionally, I don’t post a lot of the detail images to homeLA’s social media channels. And then I’m reminded that it all comes down to the process of storytelling. Those detail images have to do with how I tell stories of past shows. They create a sense of identity for/from each home that allows me to establish a sense of what the home was like and who lived there when I share it with the larger audience at a later date. As such, it’s not documenting for the sake of archiving, it’s documenting for the sake of revisiting, and communicating, and this was true as I photographed my grandfather’s home. Motivated by the desire to give myself the ability to tell this part of family story in the future I sought to capture who my grandfather was at the time of his death, and who I was at the time I took the photos. So I’ve come to realize that my experience with homeLA is unique in that I get to be both the documentarian and the storyteller of the project, which allows me to not only see (and communicate) the growth of the project but of my own style and approach to each home. I’ve seen my work become more focused on the personal and less on the architectural. I know the moment it shifted too. A picture of his and her shoes lined up in the walk-in closet of homeLA // San Marino in 2015. It was the first home that the desire to capture the specific elements of the two story home outweighed the layout of the house. The lyre-playing mythical figure on the piano. The cat hair figurine in the living room, the tile work in the kitchen. The shoes in the closet. I had moved from architecture to accumulation within architecture, which I’d say allows me to capture a more specific glimpse of the time and place of each iteration - examining life beyond any sort of picket fence presentation strangers see from outside. And when you get to that level of detail, it’s not just the knick knacks, but rather the condition they’re in, the way they’re arranged. As Catherine and I explore, the areas that get more attention than others tell a story. It was a sad moment when I realized the house wasn’t the way he left it on the last day he was there. The cleaning lady had come. But she’s part of his lifestyle. She kept him in order. She knew not to touch the comb or eye drops on the dresser. A detail I later discovered. I wasn’t surprised by it, but I wasn’t expecting it. That’s what excites me about homeLA - there are all these discoveries that need to be made, that I get to uncover, asking what happens behind closed doors when we’re not entertaining and fall into our routines? It’s at that level - the accumulation of details - that you are able to create a clearer portrait of a person. For Catherine, during homeLA, and in my grandfather’s home the essence of a time and place created a portrait of a person through the details of their home, and in each situation the ability to do so was shaped by a transitionary moment. For Opie the moment occurred when Elizabeth Taylor passed away during the process, which Catherine said impacted the feeling captured in the subsequent photos. For each homeLA, I’m aware that we’ve only got a finite rehearsal period, and an even smaller window to capture the final works during the performance, which ultimately shifts with the addition of guests into the space. And in my grandfather’s home, I knew I wanted to capture the home as he had it, immediately before family entered, but also capture as much of the time period in that space as we got rid of things. Not necessarily capturing the grieving process but the time and place in our lives as we sorted through the home and its belongings. Our objects are significant because at some time and place they’re of interest to us. And the way we keep them, re-arrange them, speaks to where we are in our lives at that given time and place. For Catherine’s process, it was not just a time and place in Elizabeth Taylor’s life, but what became the final time and place, in which we learned what she cared about and how she maintained things in the end. A year later, I found myself documenting the final phase of my grandfather’s home and came to allow myself to be part of the process in a way I didn’t anticipate - thanks to considerations I experienced from seeing Opie’s work. We’re done cleaning out my grandfather’s home and I documented the entire process. It didn’t make it any easier - and a few times it was hard to stop and snap - but it’s how I worked through it, and in the process discovered new ways of understanding my work. Something I’d been thinking about for over a year. 700 Nimes Road was really powerful for me in that it demonstrated that what I had been doing for years was part of a larger vocabulary. That my interest in photographing images of personal details is a form of portraiture, but that looking that closely is a process and one that I should recognize my role with in that process. Catherine and her work helped me feel comfortable within my own process. “Accumulative Collaboration - Intuiting Hand Choreographies” Using machine knowing to design for contagious embodiment. “Accumulative Collaboration” is both experimental and site-specific research in which we investigate “embodied knowing” alongside “machine knowing”. In “Accumulative Collaboration”, we are collaborating with an open-source, neural network (a form of artificial intelligence) to facilitate human to human connections and embodied knowing. Participants are asked to improvise gestures with their hands in front of a computer to train a neural network, which learns the movements. The hands train the neural network and a duet between machine and human ensues. The hand improvisations become training data for the neural network. In turn, the neural network facilitates an accumulative choreography -- one participant follows another, building off of previously improvised hand gestures. A contagion of choreography? We hope so! We (you as participants and we as researchers) are training the neural network together. A Leap Motion Controller will detect hand movement and send this data to Wekinator (an open source machine learning tool). How do we bring ideas of “machine knowing” with “embodied knowing” into conversation? More broadly, how do we unpack and widen discourse around A.I.? In the context of A.I., how do we re-contextualize the physical body as an entity with its own rhetorical agency? And perhaps our favorite.. What is a radical AI? The barrier to “improvising” with one’s hands seems to be lower. Audience members do not need formal movement training to “dance” with their hands (compared to if we were to ask participants to “improvise” on the spot with their bodies). As a model for culture, the rhizome resists the organizational structure of the root­tree system which charts causality along chronological lines and looks for the original source of 'things' and looks towards the pinnacle or conclusion of those 'things.' A rhizome, on the other hand, is characterized by 'ceaselessly established connections between semiotic chains, organizations of power, and circumstances relative to the arts, sciences, and social struggles.' Rather than narrativize history and culture, the rhizome presents history and culture as a map or wide array of attractions and influences with no specific origin or genesis, for a 'rhizome has no beginning or end; it is always in the middle, between things, interbeing, intermezzo.' The planar movement of the rhizome resists chronology and organization, instead favoring a nomadic system of growth and propagation. With this philosophy in mind, I am developing a wellness tonic using rhizomes to provide an element of respite throughout the evening. In this liminal space, we can wander, reflect, and rejuvenate in each other’s company. The first homeLA performance I created was RAKED, a ritual performance that displays the construction and deconstruction of a powder covered hill, at Rose Hill in September 2016. The work pays homage to the histories of my migrant parents, who immigrated to America to tend to the land by working in fields. RAKED is a work that brought me back to my California roots as a child of immigrants. Almost a year later, I’m returning to homeLA with similar interests, inquiries, and commitment to my home. RAKED is about labor, love, and loss, and how the land and the bodies are infused with trauma — my work often involves thematic displays of physical, mental, and emotional trauma. In this work at homeLA, Revisited, themes of the migrant plight have emerged in an unexpected way. Coincidentally, I began conceptualizing my work at homeLA // Larchmont. I came across a bunch of little brick-size cardboard boxes that I knew I wanted to use as material for this work. I started building a wall. Perhaps this was a little more obvious, but I thought of how borders, walls, and shores may serve as sites of trauma. With these projects, both the Annenberg Community Beach House Choreographic Residency and homeLA, I am confronted with issues where I’m exploring otherness and the call to action through the power of the image and symbols. want me to cut you a slice? want to cut off a piece? want me to slice you? We have known each other’s work for years but this is our first collaborative project. 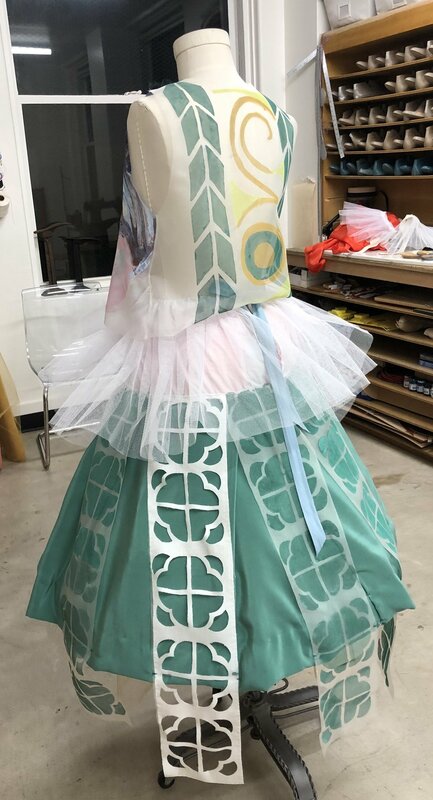 Areas of overlap in our individual practices were evident, such as a focus on process, the use of tactile materials, and an interest in text and the performing body. We have been open to the ways our collaboration can encompass and expand our solo work and have been sensitive to the elements that have emerged organically through the rehearsal process. A particularly productive step in our process was to write out a set of instructions for each other, and perform these in the space. As each action was performed, considered, reconfigured, and in some cases discarded, the genesis of our project began to take shape. During this session our conversation flowed between memories of our grandmothers who both used their hands to cut and stitch, visions of forms and materials, and reflections on the inspirational work of Lygia Clark, Lil Picard, Lygia Pape, Yoko Ono, and Věra Chytilová’s film, Daisies. We are excited to see how the work will continue to grow and shift, and we invite you to experience this with us on August 26th. Houses often outlive their architects. To date, The Neutra VDL Research House has survived its creator by 47 years. This survival has special significance, because Richard Neutra built the home for himself and his wife to live in. He built it to respond to their personal needs and desires, and today the house continues responding to those who enter. Neutra described architecture as alive— even going so far as to liken the experience of certain buildings to “the thrill of a lover.” I’ve been blessed to work inside his house’s crafted embrace. The work I’m creating for the house involves some surprises I don’t want to divulge until I perform them. What I can tell you is that I’m attempting to embody this kind of posthumous life — the kind that Richard Neutra left breathing on Silver Lake Blvd. The agency that a house can possess is truly passive, and that’s a magical paradox. The house depends on the movement of others to animate, and at the same time its animations were premeditated. In this sense they are endowed with intention, despite being passive. They are designed reflexes. The house responds constantly to light, wind, and, when they’re present, people. The design of these responses might be as simple as the positioning of a bed near a generous window. Afternoon sun turns commonplace wrinkles in the bedlinen to dramatically outlined fractals. They resemble human veins. In this same bedroom, there is a double mirror. It allows you to see some piece of yourself reflected infinitely. At the same time, because of the way the mirrors are sized and arranged, it’s impossible to see your whole body duplicated more than once. With each duplication, the reflected portion of the body gets smaller. I’ve tried to show this phenomenon with a mirror selfie, because anachronism is also inevitable when a house outlives its designer: contemporary culture and technology will always frame new images of the past. In the second reflection of my body, my iPhone cuts off my head.